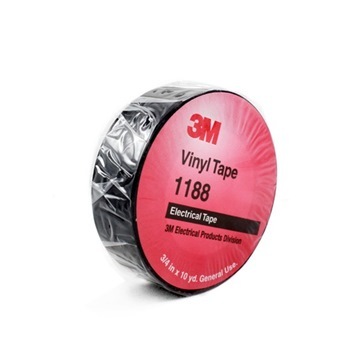 3M PVC Tape is designed primarily with the purpose to provide insulation for electrical and mechanical protection. 3M 1188 and 1710 PVC tapes are make available in 8 colors. 3M PVC INSULATING TAPE 1188 10PCS is rated 5.0 out of 5 by 1. 3M PVC Tape is designed primarily with the purpose to provide insulation for electrical and mechanical protection. 3M 1188 and 1710 PVC tapes are make available in 8 colors. Rated 5 out of 5 by chippy from Great all-purpose tape! Tape is sticky enough to secure yet easily removable without any residue left. If you are looking for a non-permanent tape, this is it!